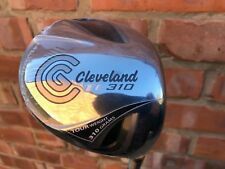 Cleveland TL310 Driver (9.5 Degree, Miyazaki C.Kua 59S Shaft). Great driver in good condition. Standard length. Is nice and low spin for superb distance. No headcover hence low start with no reserve. Cleveland Classic XL Driver 9 deg Stiff. Condition is Used. Dispatched with eBay delivery – Shutl 1 day. Cleveland Classic XL driver 285 9degrees of loft Miyazaki B Asha 4S stiff flex shaft...international flex code 6732 Head cover included Shaft..grip..head cover are in excellent condition... face and sole have usual play marks...tho it has a very small dent on the toe ..see pictures..only cosmetic. MIYAZAKI BASHA STIFF FLEX 45 GRAM GRAPHITE SHAFT. 8.5 DEG RIGHT HAND. MIYAZAKI B-ASHA STIFF FLEX GRAPHITE DRIVER SHAFT. SORRY NO HEAD COVER. RIGHT HANDED. NEW CLEVELAND 1 WOOD DRIVER GOLF CLUB. FULLY ADJUSTABLE HEAD WITH SETTINGS OPEN CLOSE ADD LOFT AND DELOFT. 100 PERCENT GENUINE. Shaft Miyazaki 39R. 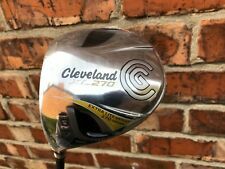 Cleveland XL 270 12 Degree Driver. Model XL 270. Head: 7 - Good Shaft: 7 - Good Grip: 8 - Very Good. Loft 12 Degree. Shaft Material Graphite. Club Type Driver. Flex Regular. NEW CLEVELAND CLASSIC XL 1 WOOD DRIVER GOLF CLUB. 100 PERCENT GENUINE. Stiff flex 45g shaft. Cleveland Black Driver. Shaft Kuro Kage 60g. 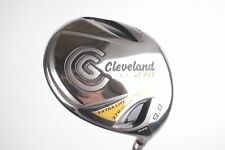 Cleveland XL 270 9 Degree Driver. Model XL 270. Flex Stiff. Head: 7 - Good Shaft: 7 - Good Grip: 6 - Fair. Loft 9 Degree. Shaft Material Graphite. Club Type Driver. Miyazaki B.Asha Tour Issue 3R regular flex graphite. Cleveland 588 non matching. Golf Pride Cleveland logo. Head - 8.5, shaft - 8.5, grip - 8.5. 10.5 degrees. MATRIX BLACK TIE HD 65 GRAM REGULAR FLEX GRAPHITE SHAFT. 1 WOOD DRIVER SHAFT AND ADAPTOR GRIPPED TO STANDARD LENGTH. Cleveland Launcher SL290. 10.5 Degree Driver. Lincs Golf. Shaft Flex - Extra Stiff (X). Loft - 8.75 Degree. Expect to receive your item within 48hours of dispatch. Live local?. Bring your old clubs with you! Head Condition - 7 Good. ALL WEATHER CLEVELAND GRIP. Auctiva Free Image Hosting. CLEVELAND LAUNCHER GOLD REGULAR GRAPHITE SHAFT. CLEVELAND LAUNCHER 400. TITANIUM 9.5 DEGREE LOFT. CLEVELAND GRIP. Shaft Cleveland 65g. Cleveland Launcher 9.5 Degree Driver. Model Launcher. Grip Cleveland. Flex Stiff. Head: 6 - Fair Shaft: 7 - Good Grip: 6 - Fair. Loft 9.5 Degree. Shaft Material Graphite. Cleveland HiBore 9.5dg Driver. Stiff 65g Graphite Shaft. Cleveland Black Grip Fair Condition. Fitted with a Fujikura Flightspeed Stiff Flex Graphite Shaft. Cleveland Hi-Bore Monster XLS Driver. Standard Cleveland Grip. 9.5 Degree Loft. The club head is in VERY GOOD condition, just a few light superficial marks. Cleveland Hibore XL. 9.5 Degree Driver. Lincs Golf. Standard Cleveland Grip. Good Condition, as seen on pictures. Cleveland Classic XL Left Handed 10.5 Degree Driver. Shaft Matrix Ozik Black Tie 6M3. Head: 7 - Good Shaft: 7 - Good Grip: 7 - Good. Loft 10.5 Degree. Shaft Material Graphite. Model Classic XL. Club Type Driver. ALDILA 65 GRAM SENIOR FLEX GRAPHITE DRIVER SHAFT. ALL WEATHER CLEVELAND GRIP. MITSUBISHI RAYON FUBUKI 53 GRAM X5CT REGULAR FLEX GRAPHITE SHAFT. 1 WOOD DRIVER SHAFT AND ADAPTOR GRIPPED TO STANDARD LENGTH. NEW CLEVELAND 1 WOOD DRIVER GOLF CLUB. INTERNATIONAL FLEX CODE 3411. 100 PERCENT GENUINE. Shaft: Aldila NV 350. Club:Cleveland Launcher Comp Left Handed Driver. Cleveland Launcher Comp Left Handed Driver in good condition overall. The head has usual wear expected from use including marks on the crown but nothing of which affects play in any way.